Sometimes I would hear my daughters playing albums of old Iranian singers, the ones who had transplanted themselves to Los Angeles over two decades ago. "That's Mahasti, isn't it?" I would ask. "Or maybe Haideh?" They would look at me with disbelief. "Maman, how could you know that?" As though these disembodied voices coming out of the stereo had not once been live performers who sang in the restaurants and hotels of Tehran. It was difficult for my daughters, and for most young people, to fathom such a time, because this Iran - the one where a woman's voice was forbidden in public - was the only reality they had ever known. From Iran Awakening by lawyer, human rights activist, Muslim and founder of Centre for the Defence of Human Rights in Iran, Shirin Ebadi. 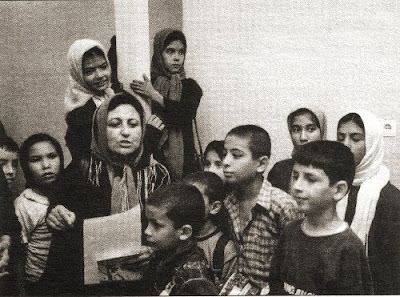 She is particularly noted for her advocacy of the rights of women and children in Iran under the mullahs, and my header photo shows her speaking at the Society for the Defence of Children's Rights in Tehran. Shirin Ebadi was awarded the Nobel Peace Prize in 2003. 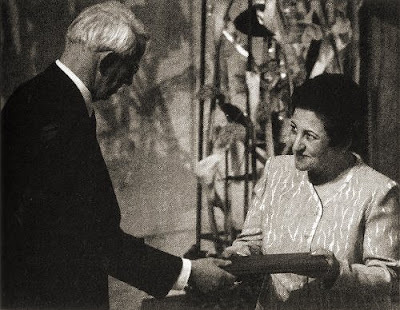 She is seen below accepting the award, and at Tehran airport after accepting the award in my footer photo. In 2004 Shirin Ebadi filed a lawsuit against the U.S. Department of Treasury over restrictions she faced over publishing Iran Awakening in the United States. These restrictions prevented the publication of new books from Iran and other embargoed countries without special license. 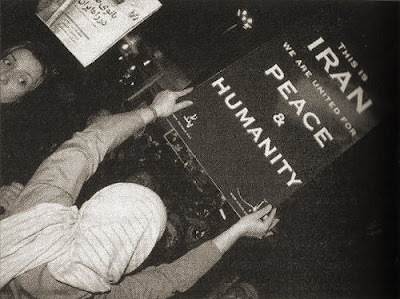 With pro bono support from a leading US law firm, Ebadi, and a group of publishers, editors and translators who faced the same restrictions, forced the US treasury Department to revise its regulations on publications from embargoed countries, allowing Iran Awakening to be published in America. It reminds me of a truth that I have learned from my lifetime, one that is echoed across the ages: that the written word is the most powerful tool we have to protect ourselves, both from the tyrants of the day and from our own traditions. Whether it is the storyteller of legend Scherezade, staving off beheading by spinning a thousand and one tales, feminist poets of the last century who challenged the culture's perception of women through verse, or lawyers like me, who defend the powerless in courts, Iranian women have for centuries relied on words to transform reality. Western classical music in pre-revolutionary Iran here, protest cinema here, an opera about Iranian civil rights abuses here, and music for Iranian's nuclear programme here. One of the saddest things to happen in Iran (amongst many sad things) is the persecution of the Bahá'í’s, who have a fascinating music tradition of their own.